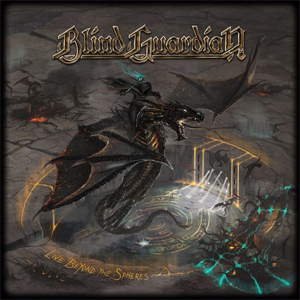 There's big news for BLIND GUARDIAN: The progressive power metal pioneers announce the release of a new 3-CD package entitled Live Beyond The Spheres! This will include material recorded from various shows during the European tour leg in 2015 - among old classics, new tracks as well as songs that are played very rarely during live shows. "In general I would say that we've had a really good run on this tour and that nearly every show was perfect. But at the end of the day, after every band-member has checked each and every song and concert of those 30 shows again and again, there were only like two or three versions of each song being suitable to be used for an album. We then had to decide between those last remaining versions, which would have been the most impressive one. This was a nearly endless task!" "The songs finally chosen reveal such an energy, that possible smaller mistakes appeared to be totally unimportant for the evaluation. As soon as you have listened to the songs, you will know what I mean, they feel alive", the vocalist continues. "There is always something happening at each show, let's call it 'MAGIC', that is giving us all creeps. We are really satisfied when the people sing with us, have a good time and go back home happy." Live Beyond The Spheres is scheduled to be released on July as a 3-CD package. "The Bard’s Song (In The Forest)"